Maruzen, the historical stationer of Tokyo, opens the Spring pen season in this city with the Maruzen World Fountain Pen in early March. This year this event celebrates its 10th edition, at the time of the 150th anniversary of Maruzen company. For the occasion, a limited edition pen hit the market together with some other commemorative stationeries. Maruzen is largely responsible for the introduction of the fountain pen in Japan. Maruzen did so by importing this novelty writing tool from Britain and the US in the beginning of the twentieth century. Maruzen soon started selling some of those same pens –mostly Onoto and Waterman-- under its own brands like Zenith, Albion and Orion. It took a bit longer for Maruzen to manufacture its own pens. The domestic production relied on the works of Sakasai Eisaburô, who by 1925 was working exclusively for Maruzen. The Athena Renaissance 85 corresponds to this period. It was initially marketed in 1934. 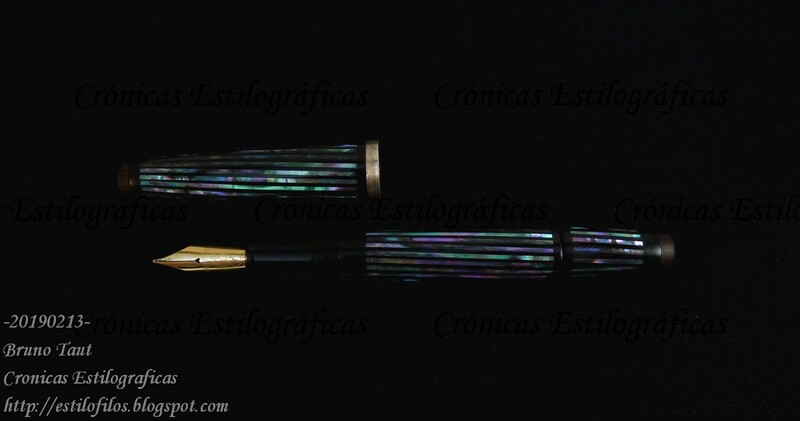 This is a lever filler made of ebonite with a 14 K gold nib. Athena Renaissance 85, from 1934. A Sakasai Eisaburô manufacture. Sakasai passed away in 1937 and Maruzen took over his factory to continue with the production of its own pens. The factory, located in Shinagawa (Tokyo) was destroyed during the war, and a new plant in Katsushika (Tokyo) was built. Here, new pens showed up in the market in the early 1950s. Such is the case of the second pen—an urushi coated ebonite pen with a lever filler and a 14 K gold nib. 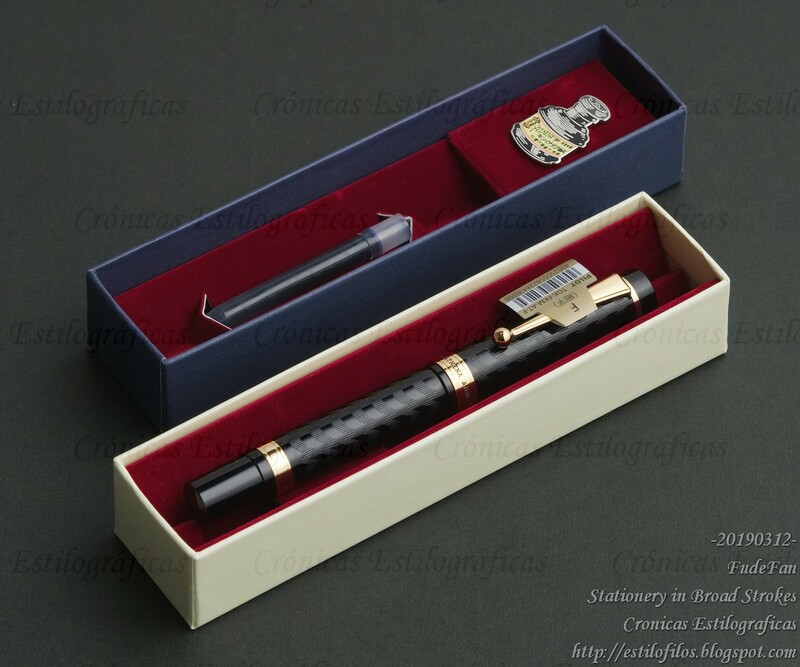 It carries the JIS engraving issued by the Ministry of Industry in 1952-53 on fountain pens. Another lever filler--a post war pen from around 1955. A third example is the pen in the “Ultra” fashion initiated by the Pilot Super Ultra of 1959 (::1::, ::2::, ::3::). On this case, the pen was released in 1964. It is an aerometric filler, with a 14 K gold nib and a generous decoration on the section, where the brand “ATHENA” is imprinted. An Athena pen from 1964. Its original price was JPY 2500. The in-house production of pens ended in the 1970s, and for some time the brand Athena was limited to the Maruzen inks. 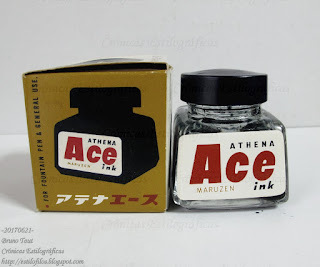 Athena ink by mid 1965. Athena Ace. Maruzen's fountain pens resurfaced in 1994 through a collaboration with Pilot. Since then, Athena pens are Pilot pens in disguise, often implementing size #10 nibs. The Athena Basic Line (ca 2003) follows that idea. The Athena Basic Line, from around 2004. It has an obvious similarity with the Pilot Custom Heritage 912, from 2009, with which the Basic Line shares the nib. The 150th anniversary Athena pen has a shape that is very dear to Maruzen. This is the “Onoto type” (albeit in the quite personal Maruzen style)—a very cylindrical pen with a thinner barrel end where to post the cap. This pen also implements a size #10 Pilot nib, and the well-known converter CON-70. This edition is limited to 500 units, and its price is JPY 45000, plus taxes. The "Athena the Pen" made for the 150th anniversary of Maruzen. Its retro packaging is particularly attractive. Photo courtesy of FudeFan. On his blog you can find a more detailed description of this pen. So, after 150 years, Maruzen seems alive and well, and its main shop in Nihonbashi is one of the basic references for stylophiles in Tokyo. Should Maruzen make its own pens, the situation would be even better, but that might be asking too much. I have what I assume to be a 92CC by this catalog (https://ameblo.jp/kamisama-samasama/entry-12180180791.html), in that it looks like the pictured 82CC but is an eyedropper rather than a lever filler. It has an Athena Clip z-clip (rather than the earlier riveted type), and is marked "Athena the Pen/Maruzen Co Ltd/Made in Japan" on the barrel. Unfortunately, the nib has been replaced with one of those Special Iridiums that always like to crop up at the worst moments. I also have a Maruzen's Athena 14k nib much like those in the linked catalog, but sitting in a pen marked "Maruden Fountain Pen" with a New Clip. So after all that introduction - does the Athena nib belong in the Maruden, or can I pull it out with no regrets and stick it into my Athena? I am not aware of any non-Athena Maruzen pens (save for those you mentioned in your post), but then there are a lot of things I'm not aware of. It is very hard to say anything out of your words without any picture and without touching the pens you mentioned. Bruno, thank you for such an informative post. Knowing the back history on Athena branding makes "Athena the Pen" so much more enticing! Thanks, Anonymous, for your comments. I am happy to know my texts are of interest.